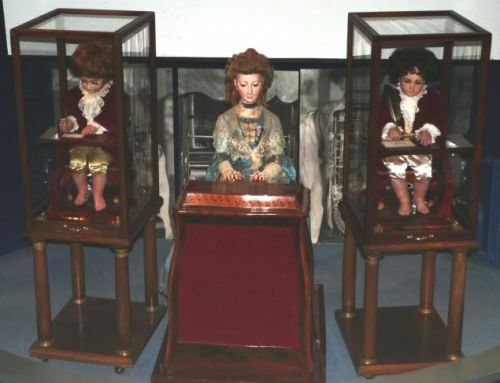 Mechanical automata fascinated people in the eighteenth and nineteenth centuries. Historians have primarily focused on their role as 'progenitors of the industrial revolution' (Shaw-Garlock, 2011: 3). This article views them through a different perspective, examining their role as indicators of cultural characteristics. The analysis follows Prown's (1982) methodology beginning by describing the automata and followed by formulating an argument, which is consolidated by drawing on further sources. The article reveals important similarities between Japanese and European societies. Firstly, the material culture of the automata is examined to show that in both societies a culture of conspicuous consumption existed. Secondly, the mechanics of the automata are analysed to challenge Eurocentric views holding that Europe was on an unequalled path of technological development; and finally, the automata's impact on the intellectual field is studied to argue that they contributed to the emergence of a more mechanistic outlook on man, nature and society. Material artefacts are invaluable in the study of history, because through them a historian can 'encounter the past at first hand' (Prown, 1980: 208). This article is a study of an aspect of material culture, which can be defined as the study of material objects to understand culture, to discover the beliefs - the values, ideas, attitudes and assumptions - of a particular community or society at a given time' (Prown, cited in Harvey, 2009: 6). Believing that the study of 'comparisons is essential for the writing of history' (O'Brien, 2006: 4), the focus in this article will be on Japanese and European mechanical automata, produced and consumed in the eighteenth and early nineteenth centuries, i.e. during the time when they reached the 'height of their popularity' (Stafford et.al., 2002: 268). Historians have mostly been interested in these objects for their role as precursors of the industrial revolution in Europe. This article will take a different approach and will examine their role as indicators of cultural characteristics both in Europe and in Japan. The analysis will be structured in three parts. First, the material culture of the mechanical automata will be examined to argue that despite differences in styles, in both societies a culture of conspicuous consumption existed, since value was placed on luxury and display. Secondly, an analysis of the mechanics of the automata will constitute evidence to challenge Eurocentric views holding that European societies had an unparalleled path of technological progress and an unequalled level of technical expertise during that period. Finally, the automata's intellectual significance will be examined and it will be argued that the construction of such contrivances affected philosophical thinking by encouraging a more mechanistic outlook on man, nature and society. Material objects serve as important 'cultural releasers' (Prown, 1982: 6), since their study illuminates particular characteristics of the culture that constructed them. An examination of Japanese and European automata produced during the eighteenth and early nineteenth centuries reveals that the main structure of the automata was usually made of wood (or in some cases in Europe of metal) and that parts of them were covered with precious materials. Specifically, Japanese karakuri-makers often employed lacquered wood, while in Europe even silver and gold were used (figures 1 and 5). Additionally, the figures on the automata in both cultures were dressed in luxurious fabrics. For example, Kintzing's and Roentgen's 'dulcimer player' (figure 2) wore an embroidered silk dress, Jacquet-Droz's 'musician' had a dress decorated with lace, while his 'writer' and 'draughtsman' had red velvet costumes and satin trousers (figure 3). Similarly, for the production of Japanese karakuri silk textiles were also used, such as for the production of the tea-serving karakuri and of the archer karakuri (figure 4), while gold brocade was not uncommon either. Moreover, the automata were also decorated in both cultures. 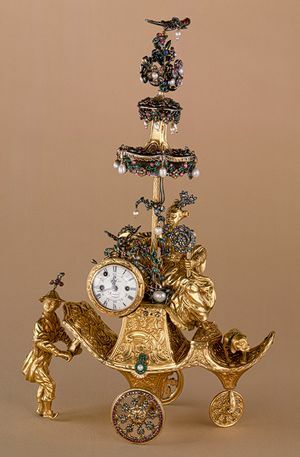 For example, Cox's automaton 'Chariot pushed by a Chinese attendant' (figure 5) was decorated with enamel and pearls and the Japanese artisans usually decorated the bases of the karakuri with elaborate paintings. Figure 2: 'The Dulcimer Player' automaton. Produced by Kintzing and Roentgen (ca. 1780s). Currently held in the 'Musée des arts et métiers'. Available at: http://blog.catherinedelors.com/marie-antoinettes-android-the-dulcimer-player/, accessed 15 July 2011. Figure 3: The 'draughtsman', the 'musician' and the 'writer'. Produced by Jacquet-Droz (ca. 1770). Wooden frames. The musician has a silk and lace dress and the draughtsman and the writer have velvet jackets and satin trousers, Currently held in the 'Museum of Neuchatel' in Switzerland. Available at: http://www.monochrome.nl/jaquet-droz-yes-we-can/, accessed 15 July 2011. Figure 4: Archer Karakuri. Produced by Tanaka Hisashige (ca. 1850). Wooden frame and silk textiles. Current location unknown. Available at: http://flickr.com/gp/stephenbegin/4B4eY7, accessed 10 March 2013. Figure 5: Automaton in the form of a chariot pushed by a Chinese attendant and set with a clock. Produced by James Cox (in 1766). Case made of gold with diamonds and paste jewels set in silver and of pearls. Dial made of white enamel. Currently held in the 'Metropolitan Museum of Art'. Available at: http://viola.bz/automaton-masterpieces-of-metropolitan/, accessed 20 April 2013. However, one cannot help but notice a few differences in the materials and the preferred method of decoration of the automata in each society. For example, the Japanese karakuri were made almost exclusively of natural materials, such as lacquer, while European automata were often made of metals. Moreover, Japanese automata were mostly adorned with scenes from nature, such as flowers, trees and cranes, while European automata were usually ornamented by adding precious stones on parts of the automaton. The difference of preferred materials can be attributed to the availability of resources in each area as well as to the meaning that was ascribed to each material. Specifically, silver and gold were more available in European societies during that period due to the exploitation of colonies that most countries possessed. Historical scholarship (i.e. Pomeranz and Wallerstein) has demonstrated the importance of these peripheries as suppliers of raw materials and bullion to the European centres, where they could be used for the construction of several artefacts, not least for the construction of mechanical automata. In contrast, although Japanese silver mines had been very abundant until the mid-seventeenth century, after the last third of the seventeenth century 'Japanese silver-mine production subsided' (Flynn and Giraldez, 2002: 403). This new reality can therefore explain the scarcity in the use of metals in Japanese karakuri as an attempt to adapt to the new reality. Specifically, during this period sumptuary laws were passed stating that 'to use foil on useless articles such as children's toys is to waste gold and silver' (Konai, cited in Keene, 1969: 99). It was more reasonable to use other luxury materials, such as lacquer, since the growth of lacquer trees was encouraged by the climate and the lacquer industry had benefitted greatly from the peace and prosperity that characterized the Edo period. Yet, the strong preference of Japanese craftsmen for lacquer was not only a result of the availability of resources. In Japanese culture, lacquer was held in high esteem for its sensory qualities, namely for its glossiness, smoothness and distinctive smell and it was also valued because its production was a slow and painstaking process, since it required the application of several thin layers that needed a long time to dry (Houlton, 2004). Similarly, the European preference for mostly imported materials, such as silver and pearls, can be understood by the appeal that these exotic commodities had on European culture. The differences in decoration preferences can also be explained by looking at the wider cultural context. Specifically, Japanese artisans were influenced by Zen aesthetics that stressed the connection between man and his natural environment and by the long-held belief that decoration should be integral to the object (Hanley, 1999). On the other hand, European artisans were influenced by the legacy of the Baroque style that emphasised an 'exuberant and dynamic profusion' of ornamentation (Huyghe, 1964: 331), as well as by the rising appeal of the Rococo movement, which despite its slightly lighter tone and preoccupation with curves and asymmetries, was still characterised by lavish decoration (The Art Institute of Chicago, 2004). 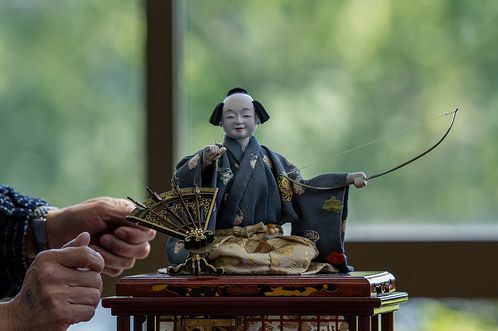 Consequently, it appears that Japanese and European automata did have a few differences regarding the materials used and the decorative style preferred, which can be explained by differences in natural resources and cultural trends. Nevertheless, the underlying similarity was the value placed on luxury revealing that a desire for conspicuous consumption existed in both cultures. Engelbert Kaempfer's description of late seventeenth-century Kyoto illustrates this point showing that there was an abundant production and demand for luxury consumer goods. There is scarce a house in this large capital, where there is not something made or sold. Here they refine copper, coin money, print books, weave the richest stuffs with gold and silver flowers. The best and scarcest dies, the most artful carvings […] the richest dresses, and after the best fashion, all sorts of toys, puppets, moving their heads of themselves, and numberless other things too many to be mentioned. The emperor surpasses all the monarchs of Europe in splendour. The kings, princes and noblemen who are his vassals, have vast riches in their territories which they spend in luxury. Moreover, it was during this period that the architectural style of shoin gained momentum, which reveals an increased acceptance of comfort and an attitude of display by the Japanese. For example, the increase in the size of the houses and the use of flooring, such as tatami mattresses, made living more comfortable and the appearance of silk curtains and decorated sliding doors suggests a tendency for ostentatious display. This is further strengthened by the existence of alcoves and shelves designed to display artistic and other luxurious items. As Golownin recorded: 'The rich Japanese make great shew with their equipages' (Golovnin, 1824: 133). Similarly, European culture was also characterised by a shift from the 'production ethic' to the 'consumption ethic' (Crowley, 1991: 191) and particularly by a strong desire for conspicuous consumption. Specifically, the eighteenth century was characterised by a mania to collect luxury objects, not only for use, but also for decoration and power display. This was commented upon by Daniel Defoe, who in his eighteenth-century tour of England noted that aristocrats of the time were 'piling their china upon the tops of cabinets, scrutoires, and every chimney-piece to the tops of the ceilings and even setting up shelves for their china-ware where they wanted such places' (Defoe and Wilson, 1830: 241). Defoe's observation is supported by a close look at contemporary inventories and wills, since they listed possessions that were 'Britain's new luxuries, conveying modernity, refinement and pleasure' (Berg, 2007: 4). Moreover, emperors and rulers were seeking to collect expensive and rare objects and were constructing private cabinets of curiosities to display them. For example, Augustus the Strong founded in 1723 the 'Green Vaults of Dresden', where he included several automata, such as the 'mechanical galleon' and the 'St. George and Dragon' automaton among other treasures. Exhibition rooms containing mechanical wonders of the time were also common in Japanese palaces, such as in the Edo castle. Consequently, it appears that both cultures enjoyed collecting rarities and objects of fascination. As a result, historical scholarship should be treated with care, since it has tended to portray the Japanese as striving to 'follow frugal […] trends […] rather than create a new culture based on plenty as occurred in Europe' (Hanley, 1999: 74). Hanley's etymological analysis linking the Japanese word luxury ('zeitaku') with waste (Hanley, 1999: 59) has reinforced this view of Japanese frugality, as well as Huffman's claim that in the 17th century Ieyasu's maxims were circulating in Japanese society, such as 'the insufficient is better than the superfluous' (Huffman, 2011: 14) and 'if you regard discomfort as a normal condition you are not likely to be troubled by want' (Huffman, 2011: 14). Moreover, the principles of Zen philosophy that emphasise simplicity and frown on luxury have also been used as evidence for the view that the Japanese were frugal in contrast to the Europeans. However, just as the protestant ethos, which 'is characteristically averse to display' (Gellner, 1988: 104), did not prevent Europeans from engaging in an attitude of conspicuous consumption in the eighteenth century, so did the principles of Zen philosophy and antiquated maxims not prevent the Japanese either. In fact, during the Tokugawa era (1603-1868), conspicuous consumption in Japan 'reached new heights' (Burke, cited in Brewer and Porter, 1993: 153), and the demand for the mechanical automata was part of it. Furthermore, it was not only the elite strata in both societies that participated in this culture of conspicuous consumption. In the case of Japan, the consolidation of peace by the Tokugawa regime and the increased affluence of the merchant and peasant classes had as a result that commoners became interested in luxury and display too, expanding the market for the mechanical automata. This is reflected in Buyo Inshi's writings in 1816, who criticised their luxurious lifestyle. The most lamentable abuse of the present day among the peasants is that those who have become wealthy forget their status and live luxuriously like city aristocrats. Their homes are as different from the common folk as day from night or clouds from mud. They build them with the most handsome and wonderful gates, porches, beams, alcoves, ornamental shelves and libraries. The taste of the wealthy people of poor descent for the ornate is also apparent in Isho Teijo Shikikuga's critique of their use of inro:. These days even common people wear […] inro suspended from the sash[…] they have become nothing more than ornaments to show off to other people. Similarly, in European societies of the eighteenth century the rising economic status of the merchants resulted in their desire for conspicuous consumption, which was frequently manifested in the 'automaton craze' (Barthes, 1989: 152). Automata were sought after by the affluent classes to display in their mansions and attract the admiration of their contemporaries. For example, the French merchant brothers Gendres bought in 1789 Jacquet-Droz's three automata (Droz, 1962: 40) and the wealthy doctor from Helmstadt, Gottfried Cristoph Beireis, purchased Vaucanson's automata, which he made even more impressive by replacing their clothing with gold and silver outfits (Wood, 1992: 31). Additionally, in England, John Hempel created automata using less expensive materials, such as plaster heads and wooden frameworks (King, 1989: 21), that were more likely to be affordable by a wider market (figure 6). Figure 6: Automaton produced by John Hempel (in 1818). Plaster head and wooden framework. Current location unknown. Available at: http://www.converyauctions.com/BidCat/detail.asp?SaleRef=0009&LotRef=665, accessed 27 July 2011. Consequently, the study of the production and use of mechanical automata indicates that both cultures were characterised by the same desire for display. Karakuri were sought not only by the emperor and the samurais, but also by the 'nouveaux riches', who placed them on their decorative shelves as symbols of their rising status. The eighteenth and nineteenth centuries were, thus, times when both societies were still officially structured in estates, but when class distinctions were being blurred by the accumulation of wealth by the lower strata and by their attempt to imitate the lifestyle of the elites. As a result, a culture of conspicuous consumption was encouraged, in which demand for mechanical automata rose. An examination of the mechanisms of European and Japanese automata yields sufficient evidence to challenge the traditional Eurocentric view of development that is still influential in historical scholarship. Historians in the 1970s argued that 'Japan did not participate in the great scientific discoveries of (seventeenth century) Europe' (Mason and Caiger, 1973: 170), a view accepted by recent historians such as Hellyer, who claimed that Europe possessed a 'distinctive scientific culture' (Hellyer, 2003: 201) and by Jones, who perceived Europe as a 'distinctive long-developing ecosystem' that experienced an unparalleled and 'miraculous development' (Jones, 2003: 45). However, despite the existence in Japan of the conservative Kokugaku movement that opposed all foreign knowledge and innovation, and despite the country's official declaration of an isolationist policy, there is, in fact, evidence that there was an active demand by the Japanese to be acquainted with the new technological discoveries and that Japan was able to keep pace with the technological progress of the West and with the developments in clock-making techniques that made the manufacture of karakuri possible. This is explained by the fact that the eighteenth century witnessed the increasing influence of the Rangaku movement, whose proponents' open-mindedness encouraged them to seek contact with the outer world. Several Japanese seemed to share Otsuki Gentaku's (1745-1827) view that 'Dutch learning is not perfect, but if we choose the good points and follow them, what harm could come of that? What is more ridiculous than to refuse to discuss its merits and to cling to what one knows best without hope of changing?' (Otsuki, cited in Keene, 1969: 25). As a result of this attitude and of Yoshimune's relaxation of isolationist measures in the mid-eighteenth century, many clockmakers traveled to Nagasaki, the only point of contact with Europe, and directly questioned the Dutch about clockmaking and others, like Takaki Seimon, specifically requested books from the Dutch containing detailed illustrations of the new techniques (Chaiklin, 2003: 94). Some even tried to learn empirically how the new mechanisms operated by following Ale Bongo No Kami's example, who dismantled a borrowed watch to uncover its inner mechanism (Chaiklin, 2003: 94) and in the two trading seasons of 1734-5 and 1735-6, the Dutch clockmaker Klujit was persuaded to stay in Deshima to teach the Japanese the mechanics of his art (Chaiklin, 2003: 94). Karakuri-makers also sought to be acquainted with the new knowledge, having realised that 'clocks can be said to be at the root of all technology related to them [i.e. to the karakuri]' as 'every karakuri ultimately uses rotating parts and escapement mechanisms' (Hosokawa, cited in Screech, 2002: 78). As a result, the long-standing Japanese karakuri-making tradition was influenced by the infiltration of this new knowledge. Japan was able to 'absorb an almost completely new technology, adapt it to suit its needs and integrate it into an autochthonous culture' (Chaiklin, 2003: 113). For example, not only were the Japanese aware of the western principle of the verge and foliot device, but they also managed to adapt it towards the end of the seventeenth century to suit their own system of time through the development of the 'double escapement mechanism' (Cipolla, 2003: 107) that allowed them to use two separate balance systems, one for the hours of the day and one for the hours of the night. Similarly, they were aware of the technology used in spring-driven clocks that began to appear in early fifteenth-century Europe (Landes, 2000) as well as of the use of escapement mechanisms as is apparent by the publication of 'karakuri zui', Hosokawa Hanzo Yorinao's manual, that contained explanations and diagrams for the manufacture of four types of clocks and nine types of karakuri. The fact that the Japanese were able to apply the new knowledge is supported by a comparison of the way Japanese and European automata worked. In both areas they worked primarily using the mainspring mechanism and escapement methods borrowed from clockwork technology. Specifically, a diagram from 'karakuri zui' explains that the tea-serving karakuri operated using a spring mechanism and a system of cams and levers, as did Hisashige's archer-karakuri, Kintzing's and Roentgen's dulcimer player and Kaufman's mechanical trumpeter. 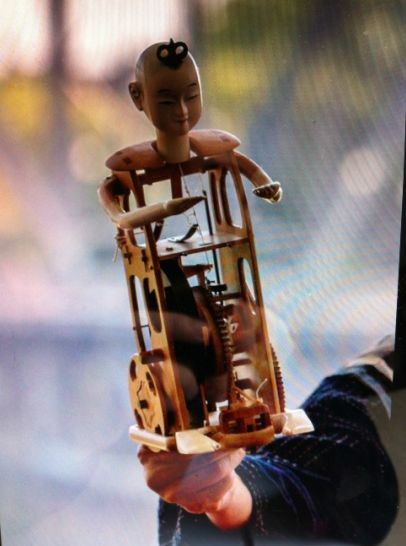 The most important difference in the mechanics of Japanese and European automata is the use of natural materials by the Japanese karakuri-makers for the construction of the different mechanical parts. Specifically, cams and gears were made of different types of wood and the springs were constructed of whalebone (figure 7), while Europeans relied mostly on metal materials, such as on the use of cast iron (figure 8). This difference was the result of a long tradition in Japan of using wood for the construction of dolls, such as for the construction of kamo and kokeshi dolls. The karakuri -makers' craftsmanship skills permitted them to continue using natural materials for the construction of the mechanical dolls in the eighteenth century, despite their increasing complexity. This was a result of their ability to choose different types of grain of wood (ADVAN Co. Ltd., 2010) and of their decision to collect wood in different seasons in order to take advantage of their differences in strength. Consequently, the analysis of the mechanics of the automata of both cultures demonstrates that the level of Japanese technological sophistication was parallel to that in Europe and that the Japanese karakuri-makers could perhaps even be described as the Japanese 'Renaissance men' (Hornyak, 2006: 25-26), since they were knowledgeable of the same developments in mechanics as their European contemporaries that were permitting them to construct these internally-operating, automatic machines. Figure 7: The mechanism of the tea-serving karakuri constructed of wood and whalebone. Available at: http://flickr.com/gp/stephenbegin/36n863, accessed 10 March 2013. Figure 8: An engraving of the 'Writer' automaton. Produced by Von Knaus (ca. 1750s). Cast iron. Does not survive to the present day. Available at: http://www.automates-anciens.com/english_version/main_pages/von_knauss_writer_automaton.php, accessed 28 July 2011. The familiarisation with the mechanics of the automata and the observation of their functioning was an important factor shaping intellectual culture during this period. Specifically, historical scholarship has demonstrated how thinking in Europe was increasingly becoming more mechanicised, by the frequent use of metaphors of mechanical automata when describing man, nature and society. However, the case of Japan has remained largely unstudied. Therefore, this article will examine the influence that the karakuri had on Japanese thinking and will argue that despite differences in the cultural traditions of both societies, a similar trend towards a more mechanistic view of man, nature and especially of society was noticeable in Japan as well. 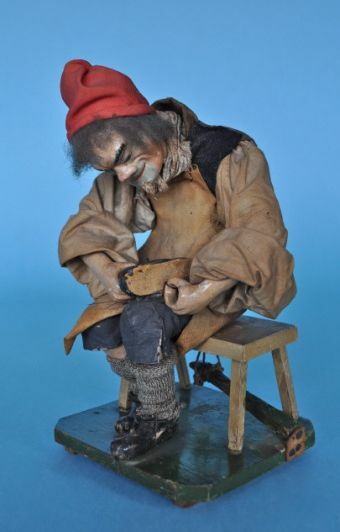 One of the ways in which the manufacture of automata shaped intellectual culture in Europe was through the comparison of the functioning of humans with that of the automata. For example, Julien Offray de La Mettrie (1709-51), in his famous work 'Man à Machine', boldly concluded that 'man is a machine' and that the way we function 'depends on the way our machine is running' (La Mettrie, 1748). Moreover, although the dualistic thinking of previous philosophers had led them to limit their mechanistic explanations to the body only, for the first time in the eighteenth century even the soul was viewed through a mechanistic lens, its role being compared to the mechanics used in the operation of the automata. For example, Gottfried Leibniz (1646-1716) famously stated that 'the soul is a spiritual automaton' that 'through divine preformation…produces these beautiful ideas, wherein our will has no part' (Leibniz, 2008: 268) and La Mettrie similarly claimed that the soul can be 'regarded, without fear of error, as the mainspring of the whole machine, having a visible influence on all the parts' (La Mettrie, 1748). This association of man with the mechanical automata was encouraged by Europe's long history of linking the animated body with inanimate parts. For example, as early as in the fourth century BC, Aristotle was claiming in 'De motu Animalium' that 'bones are like the wooden levers' and that 'tendons are like the strings'(Zittel, 2008: 274). This line of thought was inherited by medieval scholars reappearing in Thomas Aquinas's (1225-74) conviction that the movement of natural beings was similar to that of man-made contrivances - 'like the things made by human ingenuity, the things moved by nature display order' (Kang, 2011: 118) - and was also apparent in early modernity, due to the legacy of the movement of iatromechanism, which was examining the body through a mechanistic lens. However, Japanese tradition was not encouraging the appearance of a mechanistic outlook on man. For example, Zen masters were exhorting people to 'live naturally and spontaneously as 'birds in the forest and fish in the water'' (Mason and Caiger, 1973: 136) by prioritising intuition over reason. Additionally, Suzuki Shosan's (1579-1655) philosophy moved along similar lines stating that 'one's ideal as a human being should be to live in a spiritually free, autonomous fashion' (Bito, 1991: 414) and the ideal of the famous Chinese neo-Confucian scholar Zhu Xi (1130-1200) that man should aim to 'act as an autonomous being' (Bito, 1991: 418) was deeply rooted in Japanese culture too. This importance placed on spontaneity and autonomy was incompatible with the pre-established and fixed way karakuri were operating. Even so, however, a more mechanistic branch of philosophical thought became noticeable during this period, since philosophers like Ito Jinsai (1627-1705) were advocating that 'the meaning of life was to be found in the performance of the role allotted to one' (Bito, 1991: 423), just like the purpose of the karakuri was to perform the function it was designed for. Another way that the self-operating automata shaped intellectual culture in Europe was through the emergence of a more mechanistic view of nature as an entity whose functioning could be explained by its design at the moment of creation, just like an automaton's. For example, Robert Boyle (1627-91) compared the universe to an automaton operating according to its pre-established mechanisms stating that God had been able to 'make so vast a machine perform all those many things, which he designed it should, by the meer [sic] contrivance of brute matter managed by certain laws of local motion and upheld by his ordinary and general concourse' (Gordon, 2002: 52). This acceptance of the 'clock-work universe' view was facilitated by Christianity; as a monotheistic religion, it was more suited to portray the Creator as a skilled automaton-maker, who at the moment of Creation had constructed nature with all its mechanisms and laws necessary to enable it to operate independently. Additionally, the Protestant Reformation of the sixteenth century also contributed to the acceptance of a more mechanistic outlook on nature, since it denied saintly intervention in everyday life and the existence of miracles. In comparison, Buddhist religion in Japan viewed nature as being 'in a constant state of impermanence and flux' (Najita, 1991: 628) and Shintoism assigned an active role of spirits in nature, advocating that kami gods resided in it and intervened affecting its functioning. Moreover, karakuri were frequently linked to the spiritual field, since a particular type of them (i.e. 'Dashi karakuri') was specifically produced to be used in religious festivals to act as mediators between the 'sometimes overlapping worlds of sacred forces and human beings' (Law, 1997: 51). Consequently, Japanese traditional view of nature was not encouraging the emergence of a mechanistic outlook on nature, since it was believed that nature did not operate in a pre-designed way like the automata, but rather that its functioning could be modified arbitrarily by the will of the spirits. Nevertheless, despite the fact that Japan's wider cultural context was not actively encouraging the appearance of mechanistic views of nature, the increased contact of the Japanese in the eighteenth and nineteenth centuries with the mechanical automata and the way they functioned contributed to the emergence of such views. This is apparent in the philosophy of Goi Ranju (1697-1762), who, like his European contemporaries, perceived nature and the entire universe as having been 'organised internally by an ordering principle' (Najita, 1991: 625). Moreover, the appearance of a more mechanistic view towards nature was also indirectly reflected in the increasing dominance of the notion of 'kaibutsu', which encouraged an extractive, exploitative attitude towards nature (Morris-Suzuki, 1991). This view became very popular in the eighteenth and nineteenth centuries, as is apparent by the writings of Tamura Ransui, Hiraga Gennai and Sato Nobuhiro. Finally, the production and use of automata influenced intellectual culture in Europe through a comparison of the society with an automaton. For example, Thomas Hobbes (1588-1679) argued that the state was 'but an artificial man' (Hobbes, cited in Ariew and Watkins, 2009: 114), which he called 'Leviathan', and just like man's function was similar to an automaton's, 'for what is the heart, but a spring; and the nerves, but so many strings; and the joints, but so many wheels, giving motion to the whole body, such as was intended by the Artificer', so was the state's function similar to an automaton's too. Moreover, just like the different parts of an automaton had specific roles to perform, so did the different parts of the state, in order to ensure that it would operate well. Similarly, the use of karakuri in Japan had an impact on political thought as well, as is apparent by the emergence of the Shingaku philosophy. Specifically, Nakazawa Doni (1725-1803) argued that society could only function in harmony if each individual followed 'the way' that corresponded to his social status. He often used the karakuri contrivances as metaphors to emphasise the importance of adhering to 'the way' by claiming that karakuri machines only functioned well if they were asked to perform the function they were designed for (Screech, 2002: 82). Thus, society was viewed as the sum of distinct automata and its smooth operation was thought to depend on individuals following 'the way'. 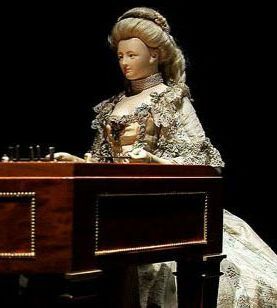 Consequently, the above analysis has demonstrated that during the eighteenth and nineteenth centuries philosophical thought in both societies was influenced by the manufacture and use of mechanical automata. Moreover, it has shown that although, mechanistic views were more firmly rooted in Europe, owing to its encouraging cultural background, they were also noticeable in Japan' s intellectual culture. In conclusion, the study of material artefacts is a valuable way of understanding the culture of a society at a given time, since material objects both reflect existing beliefs and attitudes and help understand how new ones are shaped. This comparative study of Japanese and European automata has therefore shed some light onto important characteristics of both cultures. The examination of the material culture of the artefacts has indicated a tendency for conspicuous consumption, which appears to have been widespread across the different social classes in Japan, just like it was in Europe. Moreover, the observation of the mechanics used in the production of the automata demonstrated that Japan and Europe were on similar tracks of technological expertise and that European technological progress was not unparalleled in Asia as is commonly believed. Finally, the 'mechanization of the world picture' (Dijksterhuis, 1969), encouraged by the manufacture and use of mechanical automata, was not only a European phenomenon. Although Japan's cultural tradition was encouraging more animistic than mechanistic ways of thought, during the eighteenth and nineteenth centuries the familiarization of people with the karakuri contributed to the emergence of a new current in philosophical thinking that often resorted to mechanistic metaphors to explain man, nature and society. 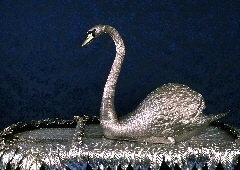 Figure 1: The 'Silver Swan' automaton. Reproduced by kind permission of Syd Neville. Figure 2: 'The Dulcimer Player' automaton. Reproduced by kind permission of Catherine Delors. Figure 3: The 'draughtsman', the 'musician' and the 'writer'. Reproduced by kind permission of Frank Geelen. Figure 4: Archer Karakuri. Reproduced by kind permission of Steve Begin. Figure 5: Automaton in the form of a chariot pushed by a Chinese attendant and set with a clock. Reproduced by kind permission of Viola Bz. Figure 6: Automaton produced by John Hempel. Reproduced by kind permission of Daniel Agnew. Figure 7: The mechanism of the tea-serving karakuri constructed of wood and whalebone. Reproduced by kind permission of Steve Begin. Figure 8: An engraving of the 'Writer' automaton. Reproduced by kind permission of Philippe Sayous. Varvara-Vera Pratikaki graduated from the University of Warwick in 2012 with a First Class honors degree in History. She has completed her masters in Global and Imperial History at Oxford University and is currently finishing her BSc in Psychology from Derby University and starting her practice in Cognitive Behavioural Therapy. Morris-Suzuki, T. (1991), 'Concepts of Nature and Technology in Pre-Industrial Japan', East Asian History, 1, 81-97. To cite this paper please use the following details: Pratikaki, V. (2013), 'A Comparative View of European and Japanese Cultures through a Study of their Mechanical Automata in the Eighteenth and Early Nineteenth Centuries', Reinvention: an International Journal of Undergraduate Research, Volume 6, Issue 2, http://www.warwick.ac.uk/reinventionjournal/issues/volume6issue2/pratikaki Date accessed [insert date]. If you cite this article or use it in any teaching or other related activities please let us know by e-mailing us at Reinventionjournal at warwick dot ac dot uk.